Beijing has changed a lot these years. 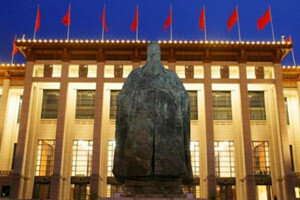 Due to its long history, Beijing has many buildings in ancient style, such as the Forbidden City, the Temple of Heaven etc. However, more and more modern architecture sprung up these days. 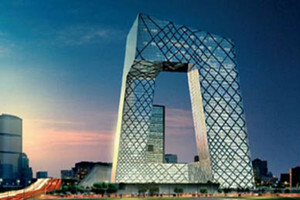 The following are the top 10 Beijing modern architecture. The National Stadium, also known as the Bird’s Nest, is a stadium designed for the 2008 Summer Olympics and Paralympics which is one of the most famous Beijing modern architecture. The main body of the National Stadium looks like a bird’s nest where steel frames support each other and converge into a grid formation to embrace the bowl-shaped seating area. 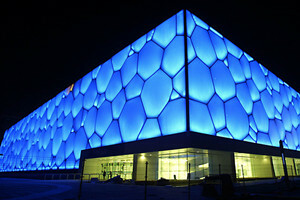 National Aquatics Center, colloquially known as the Water Cube, is an aquatics center that was built alongside Beijing National Stadium in the Olympic Green for the swimming competitions of the 2008 Summer Olympics. Despite its nickname, the building is not an actual cube, but a rectangular box. Ground was broken on December 24, 2003, and the Center was completed and handed over for use on January 28, 2008. Swimmers at the Water Cube broke 25 world records during the 2008 Olympics. 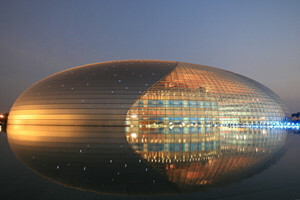 Situated in the heart of the capital, next to Tian’anmen Square, the National Center for Performing Arts is Beijing’s foremost cultural center. Designed by architect Paul Andreu, the theater has been one of the most talked-about architectural projects for years, because of Andreu’s audacious and innovative design and the project’s grand scope. The curved building features a titanium shell and emerges like an island at the center of a lake. Terminal 3 of Beijing Capital International Airport started construction on March 28, 2004, and became fully operational on March 26, 2008, when Air China, Shanghai Airlines, other Star Alliance members and other international airlines moved in. Designed by Netherlands Airport Consultants B.V. (NACO) and UK Architect Norman Foster, Terminal 3 is one of the world’s most environmentally sustainable airport buildings, designed to accommodate Beijing’s cold winters, hot summers, short autumn and spring seasons. 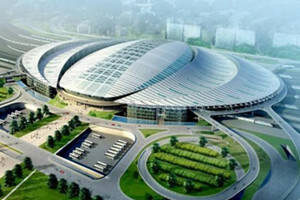 Covering an area of 499,000 square meters, the South Railway Station is the second largest in the capital after Beijing’s West Railway Station. It has 13 platforms and 24 arrival and departure lines, and consists of two floors above ground and three floors underground. 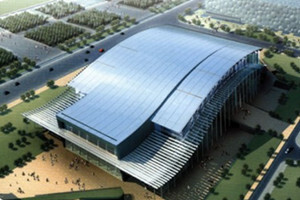 On August 1, 2008, the station was put into use and now serves as the terminal for the inter-city express rail between Beijing and Tianjin. 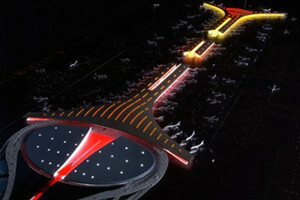 In the future, it will become a high-speed rail terminal for the Beijing-Shanghai route. 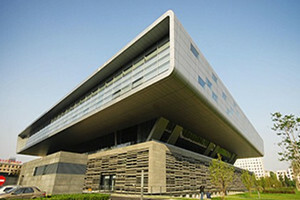 A brand-new extension of China’s National Library opened on September 9, 2007. 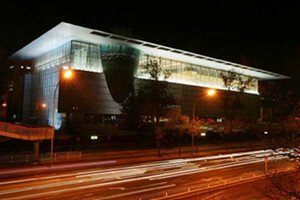 Designed by a German architectural firm, the modern library is the world’s biggest Chinese literature collection center and digital resource base, as well as the most advanced network service base in China. The new addition makes the total construction area of the National Library over 250,000 square meters, ranking third in the world, only behind the U.S. Library of Congress and the Russian State Library. 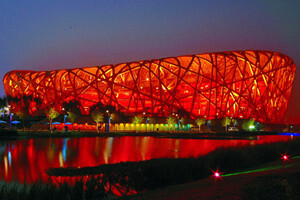 As a neighbor of the Bird’s Nest and the Water Cube, the National Indoor Stadium is also a part of the Olympic Park. It is nicknamed the Fan, (Chinese: “shanzi”), due to its design resembling a traditional Chinese folding fan. The steel roof of the National Indoor Stadium is 144 meters long from north to south and 114 meters wide from In the 2008 Beijing Olympic Games, the stadium hosted the gymnastics, trampoline, handball, and volleyball competitions. Being China’s second largest museum, dwarfed only by the National Museum, Capital Museum is situated in the center of Xicheng District. After nearly four years construction, the new Capital Museum reopened in May 2006 at a cost of 1.23 billion yuan (about 187 million U.S. dollars). With an area of more than 60,000 square meters, the museum consists of Central Ritual Hall, Exhibition Hall, Multifunction Hall, Cultural Heritages Storehouse and Digital Movie Hall. There are more than 5,622 culture relics on display. Standing on the east side of Tian’anmen Square, the National Museum is one of the most historic buildings in the capital. After three years reconstruction, new National Museum opened in March 2011. The current museum nearly triples the size of the complex from 65,000 square meters to almost 200,000 square meters, and the number of exhibition rooms increase to 49. It has four floors above ground and two floors underground, housing an 800-seat theater, a 300-seat academic lecture hall and a 600 square-meter studio. The new home of China Central Television (CCTV) is located in the busy commercial area near the World Trade Center in Beijing’s CBD. The tower, designed by Dutch architect Rem Koolhaas, is like two huge inverted “L’s” connecting together. This remarkable concept, a breakaway from the traditional design of skyscrapers, presents a fresh image to local residents and attracts people’s eyes miles away.